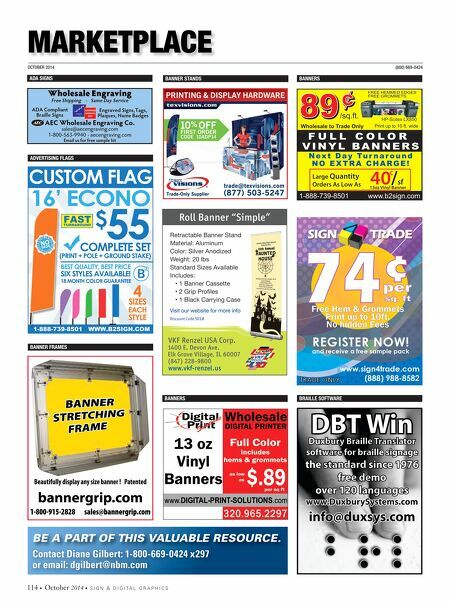 OCTOBER 2014 (800) 669-0424 114 • October 2014 • S I G N & D I G I T A L G R A P H I C S Marketplace ADVERTISING FLAGS BANNER FRAmES BANNER STANDS Wholesale DIGITAL PRINTER 13 oz Vinyl Banners Full Color 320.965.2297 hems & grommets includes as low per sq ft $.89 as ADA SIGNS BANNERS BANNERS Wholesale to Trade Only F U L L C O L O R V I N Y L B A N N E R S FREE HEMMED EDGES FREE GROMMETS 89 ¢ 89 ¢ /sq.ft. N e x t D a y Tu r n a r o u n d N O E X T R A C H A R G E ! 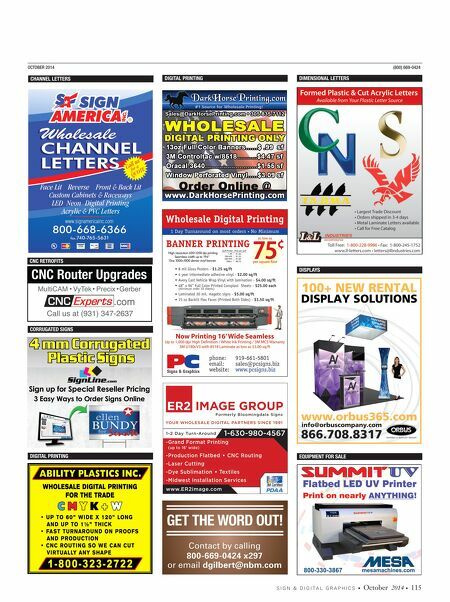 www.b2sign.com 1-888-739-8501 HP-Scitex LX850 Print up to 10 ft. wide Large Quantity Orders As Low As 13oz Vinyl Banner 40/sf ¢ BRAILLE SOFTWARE 16' ECONO COMPLETE SET (PRINT + POLE + GROUND STAKE) $ 55 CUSTOM FLAG 1-888-739-8501 WWW.B2SIGN.COM FAST TURNAROUND BEST QUALITY, BEST PRICE SIX STYLES AVAILABLE! 18 MONTH COLOR GUARANTEE 4 SIZES EACH STYLE Roll Banner "Simple" Retractable Banner Stand Material: Aluminum Color: Silver Anodized Weight: 20 lbs Standard Sizes Available Includes: • 1 Banner Cassette • 2 Grip Profiles • 1 Black Carrying Case Visit our website for more info VKF Renzel USA Corp. 1400 E. Devon Ave. Elk Grove Village, IL 60007 (847) 228-9800 www.vkf-renzel.us Discount Code SD10 Contact Diane Gilbert: 1-800-669-0424 x297 or email: dgilbert@nbm.com BE A PART OF THIS VALUABLE RESOURCE.